Telescoping lid keeps the poly liner bag concealed from view and helps maintain a tidy look. 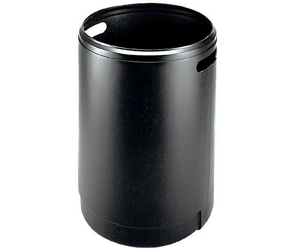 Made from a post consumer recycled high density polyethylene with UV inhibitor additive, these 45 gallon waste containers will continue to look great even in the harshest weather environments. Extra Large 45 Gallon Trash Capacity with Optional Liner. Use Standard 45 Gallon Poly Bag Liners. Telescoping Lid Keeps the Poly Bag Liner Out of Sight. Molded from Long-Lasting, 50% PCR High-Density Polyethylene. 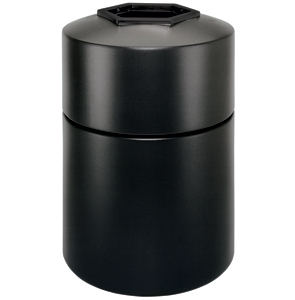 Extra large 45 gallon capacity combined with durable construction make these waste containers naturals for any high volume location. Optional bolt-down hardware and lid security cable are available.